A great place to build your business – if you do it the right way! Did you know that using forums for marketing your business is a fantastic place for driving targeted traffic to build your list? Are you using forum marketing? Perhaps you have thought about it but don’t really know where to start? Or maybe you are doing what you think is forum marketing but not seeing results? Does it frustrate you when you see others claiming that forums are great for marketing and yet however hard you try you never get to see those results? Do you wish you were seen as the expert on forums in your niche? Does it bother you that you are missing out on a huge opportunity to build your list? Well, I have produced 3 hours of audio training – a complete A to Z on how to get the most out of forum marketing just for you. To use forums effectively you have to become established as an expert and it’s really easy to do – but like so many things there is a right way and a wrong way! Do It Wrong And You Could Get Banned! Unfortunately some marketers have given the rest of us a bad name. They have used forums to spam their offers and post spammy comments just to get their post count up. Therefore people on forums are more cautious and suspicious if they detect any form of selling going on. Online Forums Are Full Of Hungry Buyers – Your Customers! 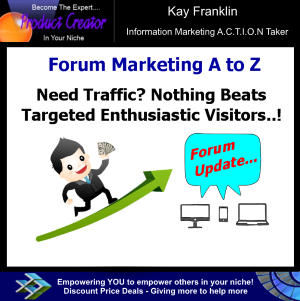 Forums are exactly where your target market hangs out – you can’t get more targeted! And forums are full of people that want what you have to offer – your customers all in one place! Potential customers who are so passionate about your niche that they will buy whatever they need – again and again – whatever it takes to achieve results! People who are desperate to learn more and more about their passion. People searching for information, wanting information, willing to buy information – can it get any better? Imagine if you knew exactly how to use that kind of targeted traffic source? Imagine being perceived as THE expert to go to on a forum in your niche…. How would it feel if you had people asking for your help? How would it feel if your name was recognised by everyone on the forum as the person of authority in your niche? Not only that, but how would it feel to know that every new person joining the forum would immediately know you are the expert and start following your posts and join your list? And how would it feel to spend time posting on a forum knowing that people are hanging on your every word? How would it feel to never have to try to sell anything to anyone because people WANT what you have to offer? Would it make a difference to your overall business? To your confidence levels? So, how can YOU start marketing yourself the right way and make huge profits from forum marketing? Well, this is exactly what I teach in my A to Z training program. Would it help if you knew exactly what to do – step by step how to market YOU, build your list, maximise your profits, develop relationships, find joint venture partners, get plenty of ideas for products that people are hungry for and more! To really help you understand my training I have created a forum marketing topic learning workbook for you to use as you listen to my training. Inside your workbook you will find all the key learning points as well as extra advice and tips. As you go through the training I have added crucial steps that you need to understand and complete and you will see these sections throughout your workbook. This workbook will really empower you to move towards becoming an expert on any forum in your niche. Every step is broken down into simple instructions and you will see at a glance what you need to do or work on. It makes forum marketing a really easy process! And every tick represents another step closer to your ultimate goal of building your own business, using forum marketing! Some times seeing things can help to cement what needs to be done in your mind. This visual roadmap will enable you to see your whole project at a glance. Stay motivated by the sight of your progress and you’ll soon complete each step far quicker than you thought possible. Would You Like To Start Building Your Reputation As An Expert On Popular Forums In Your Niche? When someone needs help who do they go to? Someone who is the expert! Someone who demonstrates their knowledge. Just imagine how it would feel if you were the ‘go to’ person on the forum. You are the expert, and you feel so empowered and confident. You are thinking “this is great, I am able to help others and make money while doing it”. And if you follow my step by step training, you could be that expert on all of the forums in your niche! What would it be worth to you to learn exactly how to generate huge volumes of high quality traffic from forums in your niche? Maybe $97?, $197? or even $297? OK, so what is my program worth? Well let’s see…what are you going to accomplish by using my Forum Marketing A to Z training program? Now, what is that worth to you? If you were able to accomplish this, what would that really mean for you? And I am going to personally assist you in achieving all of this…and more…. Either you need it or you don’t. Either you want it or you don’t! But if you want a competitive edge, instant credibility and start establishing yourself as the expert….